Join Us!!! We are looking for someone to help us cover South African basketball. Please send us an e-mail. Egoli Magic advanced into the championship game. They fired past WC Mountaineers in the semifinal clash at the Wembley Stadium tonight. The Mountaineers grabbed a 30:28 halftime lead. But Egoli Magic turned on the higher gear in the second half. They jumped to a 51:43 lead heading into the fourth quarter. Egoli Magic kept their opponents at bay throughout the final stanza and rallied to the victory. Tshwane punched the BNL Finals ticket. 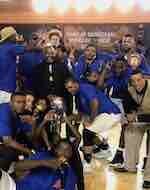 They outgunned the Soweto Panthers in the semifinal today. The Suns recorded a 22:13 lead ten minutes into the game. Soweto pulled within 4 points at the interval. But the Suns stiffened defensively in the second half. They limited their opponents to just 26 points after the big break and secured the winning outcome. 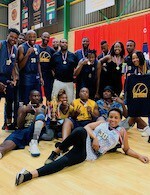 Jozi Nuggets repeated as Johannesburg Basketball League title. They faced MBB Kegs for the trophy. Jozi Nuggets grabbed the lead early in the game and maintained it until the final buzzer winning it 70-61. Neo Mothiba (200-F/G-82) was named the Final MVP. He finished with 23 points and 10 rebounds for the champions. Let me begin by thanking all of you for being here. I appreciate how far many of you have traveled to be at this game. In fact, we know from the ticket manifest, from the service we use, that fans from over 39 countries bought tickets online in order to be here, and I'm sure many others have traveled who didn't buy tickets officially. So again, welcome to this media briefing, welcome to all the fans from throughout Europe and frankly the rest of the world who chose to be here at the O2 Arena in London. This is the ninth consecutive year the 02 Arena have hosted NBA games. It is a state-of-the-art arena. In fact, once the game starts, you wouldn't know you weren't at a game in the U.S. or Canada. It's professional in every possible way, and we're very appreciative of the partnership. To the New York Knicks and the Washington Wizards, thanks to both for being here. It's a bit disruptive in the regular season for them to travel over to London for a game, but I will say they do it enthusiastically. In fact, in the case of the Knicks and the Wizards, their principal team owners chose to come with their teams. Jim Dolan is here from the New York Knicks, and Ted Leonsis from the Washington Wizards. They have been in London for the last several days, busy conducting business and other activities along with their teams. We appreciate them being here along with their entire organizations. I also want to thank the NBA's London office. That's our full-time staff here in London who puts enormous effort into hosting and conducting all the activities around this game. It's essentially a week's worth of activities. Over the last several days we've had clinics in town, Jr. NBA programs, NBA Cares programs. We've had multiple partner events. I won't name them all, but you can see the logos behind me are the partners we worked with for this event. I've said this in the past, but it feels a little bit like our European All-Star Game here in town because it's the one time in the regular season we're here and it's an opportunity for our partners and for our London office to create all kinds of activities on the ground and to host our guests and our friends. We're very appreciative of that. It is the 91st game that the NBA have played in Europe. That includes both friendlies and fixtures - I just wanted to get those words in - that we've played over the years. In addition to that, what has been exciting to see in my years now at the league is the development of the enormous talent that's coming out of Europe now into the NBA. Look no further than this year's All-Star voting. Of course, Giannis Antetokounmpo is the No. 1 vote-getter in the East right now, and Luka Doni is the No. 2 vote recipient [in the Western Conference] at this point in All-Star balloting, which is quite remarkable, especially for Luka, of course, as a rookie in the league. And by the way, for those who want to continue voting for their favorite players from Europe or elsewhere, All-Star balloting ends Tuesday, January 22. This is the first game we'll have played in Europe since the tragic loss of former FIBA Secretary General Patrick Baumann. Patrick passed away in October last year. This would have been his 25th year with FIBA. It's hard for me to be at a game in Europe without Patrick with us. We grew up in the organizations together. Before he was Secretary General, he had a staff job similar to what I did at the NBA before I became Commissioner. I think everyone certainly at the NBA owes him a huge debt of gratitude in terms of what he did over the past quarter century to help grow this game throughout Europe, and for that matter, around the world. He was also an IOC member. I think he single-handedly drove through this new three-on-three basketball that's to be part of Olympic competition beginning in 2020 in Tokyo. Let me also say to his wife, Patricia, to his daughter, Bianca, and son, Paul, we miss your father very much, and also of course the NBA family will remain close to the Baumann family forever. Again, thank you, Patrick, and all of FIBA. And I had a chance to spend a little time with Andreas Zagklis, who is the new Secretary General of FIBA. He is someone who had been working as an outside attorney at one point for FIBA and then was in-house counsel. He is stepping up now into that new position. I will say that hopefully our relationship with FIBA will not miss a beat, and we will continue to work together to grow basketball throughout the world. How likely is it that you will put on the regular-season a game in Paris, France? Is it possible for next year, the year after? I'm told I'm not allowed to break news yet, but yes, it is possible. It is something we are looking very closely at, and that is playing a regular-season game in Paris for next season. It is very important. France has historically been a terrific market for the NBA. As you know, we have several players from France as well. I know when we've played many exhibition games in Paris over the years - I remember being there with Michael Jordan, the Chicago Bulls and the tremendous excitement around that team. It will continue, I think, to be an important market. We took a number of years off because, of course, your arena was being renovated and upgraded. I haven't yet been to what used to be Bercy Arena, but I hear it's fantastic. So we're looking forward to coming back to Paris. Obviously American leagues have enjoyed a lot of success bringing their product to Europe, bringing regular-season games to Europe. But I'm sure you're aware that European soccer leagues there's been a lot of resistance to the idea of playing games in America, particularly Spain's La Liga. What do you see as the benefits of taking games away from your home country, and what would you say to those that doubt whether it could work for soccer? The issues seem to be different, frankly, from what we hear in the United States and the resistance I've read about from some of the European players and clubs. I think maybe it's because we have a very long regular season, and in this case it's only one team giving up a regular-season [home] game, and that's the Washington Wizards, and what we see as enormous amount of enthusiasm. I think the local fans accept it still means that there will be 40 regular-season home games instead of 41. They hope to make the playoffs, so it would be even more games, plus they play preseason exhibition games. I think the players, as we increasingly have a more global league - 25 percent, roughly, of our players are born now outside of the United States. We have 65 European players. I think increasingly what we're seeing with our international players is they enjoy returning home for games, and they enjoy sharing that experience with their teammates. We really haven't had all that much resistance to doing it. In fact, when we play games, especially in Europe, where it's not all that long a flight, in many cases the teams have put together programs where some of their partners and fans can travel with the team and attend as well. So it hasn't been all that controversial. I understand it's a little different approach with European football. I think in the United States, we have more sports. Those kind of close, almost tribal bonds that we see here with soccer, in some ways I'm jealous. I mean, it's a very special relationship that I think fans have to their clubs throughout Europe, and it may be a little bit different approach in the United States. You're playing preseason games in India. Longer term, how would you evaluate a market like that in terms of staging regular-season games? And how do you look at a market like that again in the longer term as one that would bring returns for the NBA and I guess basketball generally? Let me just start with the difference between the preseason game potential and a regular-season game. For us, one of the issues when we play regular-season games is because our season is so compact, we don't have as much time for activities in the community, especially when we're flying as far as India or China is from the United States. So what we find, for example, with the two preseason games we're playing in Mumbai next year, and especially since we've never played anywhere in India before, there's a lot more we can do on the ground when it's a preseason game than a regular-season game. The teams can do more of the kinds of activities I talked about earlier - clinics, community programs, sightseeing for the players, an opportunity to really get a sense of what the community is about. In a market like India where we've never even played a preseason game, there isn't really an issue. People aren't saying to us, This has got to be a fixture. I think they accept that this is a unique experience for two NBA teams to be making the trip. In China, it's essentially been the same. It's not that they wouldn't prefer that we come over with regular-season games. I think, though, there is a recognition that we have a very long season, and if we were to change the formula from preseason to regular season, it would fairly significantly shorten the trips, because there wouldn't be as much time on the ground. I think even now with some of the activities that we were able to build in, it still means that the teams need to spend a couple days reacclimating once they return to the United States. And the issue - of course it's not that long a flight, but I think because of sleep patterns, because of the five-hour time difference from the East Coast of the United States, that makes a difference for the players. But it's something we will continue to look at. I'd say, as I said earlier, we do have a long regular season, and one of the things that I'm sure we'll be talking to our Players Association about over time is should we take a fresh look at the way our season is structured. You could create more space in the season so that we could bring more teams over maybe, open up the possibility of having a tournament in Europe, a tournament in Asia or in Latin America, other parts of the world. I think there are other ways for us to look at the season, and as we bring in more international players, as the following becomes more global, as technology changes, those are all things that we're going to continue to look at. I suppose one of the biggest European draw cards isn't here, Enes Kanter. He may feel justified because that red notice from Interpol was issued when the Knicks were midair, but from an organizational point of view, you're community based. You're also looking at it globally, this organization. What's your stance? My stance is that I think it's very unfortunate that Enes Kanter is not here with the New York Knicks. I absolutely understand his reasoning why he elected not to come. Certainly there was never a suggestion from the league that he was not welcome to come on this trip. But we live in a world where these are really significant issues that he is dealing with, and I recognize that for the NBA, that by virtue of the fact that we're a global business, we have to pay a lot of attention to these issues as well. I will say there's nothing more important to me as the Commissioner of the league than the security and the safety of our players. So we take very seriously the threats that he's received, even if it's just people on social media. And again, I support Enes as a player in this league, and I support the platform that our players have to speak out on issues that are important to them. On social media, I've seen a lot of people saying, Oh, the NBA is playing an international game, great. But why is it playing it in the UK when there are other countries that might claim to have a stronger basketball culture? So obviously there are, as you said, people from nearly 40 countries who bought tickets for this game. Why is it that London and the UK continues to be such an important market and platform for the NBA in terms of its international profile? One of the reasons London has continued to be so important is it appears to be in many ways a hub for us in Europe that is easily accessible, as we know, for people from throughout Europe who enjoy traveling here for events. This particular facility, the O2 Arena, the last I looked, I think it was the highest-grossing arena in the world. They and AEG do a fantastic job hosting major league events, so that's made it very easy for us to in a very turnkey fashion to come in and play these games here. But also, in response to the earlier question, we are looking at other markets. We recognize that Europe is a huge market, that there is enormous interest, and many of the other European markets have a stronger basketball affinity even than they do here in England. It's been a marriage in part of convenience, but it's been very successful for both parties. Once again here, when we announced this game and put tickets on sale, they sold out in less than an hour. So there's no issue whatsoever in terms of demand. We do want to be in a position of bringing NBA games to other countries and cities in Europe, and that's something we're very focused on. I was wondering if you'd be able to let us know if there were any plans to televise the All-Star Draft this year? There are. We plan to televise the All-Star Draft this year. It was something we worked out with our Players Association. We thought the first year out, let's make sure that we pull it off in a way that works and that the players are comfortable with the process. They were, and this year the All-Star Draft will be televised. There are a lot of games all around the world on different continents. I know since 2015 you have the NBA Africa Game. Can we expect any preseason game or regular-season game soon in Africa? As you know, we've been playing in Johannesburg three out of the last four years. I wouldn't categorize it as either a preseason or regular-season game; it's been a collection of NBA players, an All-Star format. We've actually thought that's been very effective because we're able to take a group of players in the summer. It speaks a little bit to the earlier question. We've found there are players, in partnership with the NBA Players Association, who want to make a real commitment to Africa. They don't just want to come and play a game and participate in a clinic and go home. They want to come, they want to work in the community. In many cases, these are players who haven't had an opportunity to travel through Africa. Some use it as an opportunity to bring their families, to go on safaris. It's been an effective format for three of the last four years. And it's the same with coaches and general managers and other team executives who have wanted the experience of Africa. I think the immediate issue for us is now having been in South Africa three out of the last four years, of course Africa is roughly 55 countries, where else can we play. We know, for example, there was just a new arena dedicated in Senegal. In fact, my colleague, Deputy Commissioner Mark Tatum, was there for that dedication. We see enormous opportunity throughout the continent of Africa to continue growing the sport. We think arena development is critically important in order for that development to continue. That's something that we're engaged in conversations with African leaders about on a regular basis. But I anticipate that we will again next summer play a game, an All-Star-format-type game in Africa. I think for a regular-season game or even a preseason game, we're not quite there yet. But as I said, it's not a logistical issue. We could do it, I just don't think we'll get as much benefit from a quick trip like that. LEB Gold newcomer Real Canoe Madrid added to their roster 30-year old South African center Chris Gabriel (211-125kg-88, college: San Diego). He started the season at Team FOG Naestved in Danish BasketLigaen. In 10 games he recorded 8.8ppg and 4.2rpg this season. The last summer Gabriel played at Stockolmo (Metropolitan) in Uruguayan league where in 17 games he averaged 14.1ppg and 11.8rpg (#4 in the league). Good season as he was named League Player of the Week. His team made it to the Danish League Semifinals in 2015 and 2018. The list of the past achievements is quite long as among others Gabriel was voted Eurobasket.com All-Georgian A League 3rd Team in 2017. He represented South Africa at the Afrobasket Championships last year. His stats at that event were 3 games: 4.3ppg, 6.7rpg. Gabriel has played also professionally in Slovenia (Hopsi Polzela). He is a former Eurobasket Summer League player, which is considered top summer league for players who want to play basketball overseas. Gabriel attended University of San Diego until 2012 and it is his seventh season as a professional player.